Hi all!- Things should return back to normal pace now. The holidays are over for another year! Some are glad, some are not, but I for one am glad! I haven't made a card in about two weeks!! That is crazy! Believe it or not time did not really allow me to, because I was catching up on rest, and the creative juices were not there. Hopefully- they are returning! I have had the want to make cards- I always do- but feel sometimes and go through periods where I just need to take a slight break and gather my thoughts. Hope everyone's holiday season was happy!! 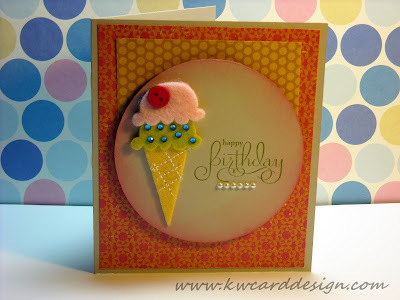 With my first card of 2011, I needed to get in the birthday mode as my hubby's birthday is coming up on the 17th! I would disclose his age but, for one I just won't, and two- let us say he has a baby face for his age!! :o) How I love my sweet husband! - OK- so, here is a birthday card I "whipped up" for today's post. Seriously, I made this in a matter of 30 or so minutes so I could get posting cards for you all again!! This is what I came up with. What do you think?? I just love these felt stickers! They are so adorable, and you can use them in so many ways, AND- it really makes a card pop if you need to make one fast!! It is my new addiction for sure right now. I also used some of paper from the 6 x 6 pad- Restoration collection by Crate Paper. These 6 x 6 pads are great for card makers! I also used some Distress Ink in Worn Lipstick. I hadn't used this color yet, and I like it, like all the Distress Inks! They are great for stamping, water coloring, you name it. These inks are very versatile. On the YouTube video front- I am still in the works of putting up my first video. I finally got my pocket camcorder in. Now- I just need to dive in and make a video. I need all the encouragement I can get, because I really want to get a broader audience, and I feel this will help me to get there!! I will keep you updated!! Stay tuned!! AND- don't forget that I have cards and some post it note holders for sale at my Etsy Shop! Well- It is getting late- I need to "close up shop" and head to bed, as I do have a day job that supports my "habit" :o) Night all! !